DrueckGlueck Casino will then reward you with a bonus (Welcome Bonus is for new players only). The terms and conditions of the bonuses vary between different casinos and might also change over time and between different countries, so it is important to compare the different offers and read the T&C for DrueckGlueck Casino before signing up. Drück Glück, translated from German, might be understood as express luck, or rather the instant wins you will get playing at DrueckGlueck Casino. Its motto is ‘Luck is coming’ after all! The DrueckGlueck Casino website is definitely one of our favorites. The nice attractive banners move across the homepage displaying a range of promo deals and codes you should use if you want to win, and walking you through the website are adorable little monsters, friendly and brightly colored. 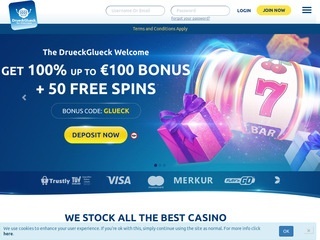 DrueckGlueck Casino is impressively international; making its website available in almost 20 European languages such has English, German, Finnish, Swedish, Italian, Polish, Croatian and Greek, as well as Russian and Turkish. This phenomenal online gambling venue holds four licenses that prove its trustworthiness and reliability. The four governing bodies that have guaranteed its trust are the UK Gambling Commission, Malta Gaming Authority, the German state of Schleswig Holstein and Danish Gambling Authority. The website was designed in such a way that it looks as appealing and is just as easily navigated on mobile devices, and is accredited by Casinomeister. Drueck Glueck was launched in 2015 by Skill On Net Ltd. Casinos. All games are regularly audited according to the standards of the licensing organizations, making sure every game round is unbiased and genuinely random. Rigorously checked by iTech Labs, Drueck Glueck sets fairness as its number one priority. The remarkably charming online casino is powered by an army of the best iGaming manufacturers in the industry including NextGen Gaming, NetEnt, Microgaming, WMS, Amaya (Chartwell), Big Time Gaming, Merkur Slots, GVG and others, and the stunning Live Dealer section is powered by Evolution Gaming and Xpro Gaming. All of the games are divided into several sections for easier and more comfortable navigation, so you can easily find slots, roulette, live casino, card games and jackpots. The software developers have put in an extra effort to combine their forces and bring the ultimate online gambling experience to all of Drueck Glueck Casino’s customers. 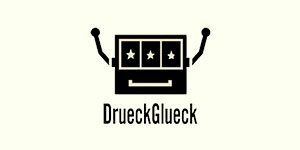 All Drueck Glueck slots are carefully divided into a few categories, sorted by themes, providers, features, symbols, the number of paylines and the number of reels. New and popular games carry a special colorful ribbon to mark their respective status. Contemporary classics like bitingly romantic Immortal Romance slot and magical Merlin’s Millions slot are fully at your disposal, as well as a line of regularly updated new launches by all of the suppliers. There are some combative slots for lovers of action such as Spartacus Gladiator of Rome slot, Gem Rocks, Penguin City and King Kong Fury slot. DrueckGlueck Casino is a host to numerous jackpot winnings, providing titles like Mega Moolah, Arabian Nights, Winstar, Genie Jackpot, Mega Fortune and Major Millions Progressive, to list just a few. This European-facing online casino boasts a rich collection of fast-paced virtual table game action with games like Baccarat, Blackjack and Roulette and multiple variants of each such as Progressive Blackjack, European Blackjack Turbo and French Roulette Pro. Among the popular games, you will also find Poker and Craps, as well as Casino War and many other casino games. You can also play on a decent number of video poker games at DrueckGlueck Casino. Most players get lucky with Aces and Faces, Deuces Wild, Jacks or Better and Joker Poker, all available in single- and multi-hand modes. A wide range of specialty games is easily found at the website. Search for the ‘Extra Games’ department and enjoy a line of scratch card games and other games like Doubles Heaven, Roll A Ball and The Big Wheel. XPro Gaming and Evolution Gaming have teamed up to bring the best Live Casino section out there. You will find a mesmerizing diversity of live games that include the likes of Live Blackjack, London Roulette, Live Roulette, Platinum Live Casino by Evolution Gaming and Dream Catcher. You can play up against a real dealer in real time and talk to your croupier as the game occurs, or you can go for the automatic dealer if you feel like it. All of the rules that apply at brick-and-mortar casinos apply here as well, and you get an authentic experience from the comfort of your home. Drueck Glueck Casino boasts one of the fastest withdrawal timeframes – it takes from 0 to 24 hours at most, which makes it stand out among other online casinos. Both for depositing and withdrawing cash, you can choose from a massive selection of payment methods, from traditional to more modern ones, so whatever is up your alley is most likely to be available. All of the bigger credit and debit cards, ewallets and other methods are available, as well as bank wire transfer, but the processing times vary. Ewallets are definitely the speediest option if you are in a hurry, but if you can wait, and then you can go for bank transfers or credit cards. The withdrawal limit totals 10,000 EUR per month, and you can choose from eleven currencies: American dollars, Australian dollars, British pounds sterling, Canadian dollars, Denmark Kroner, Euros, Norwegian kroner, Russian roubles, South African Rand, Swedish kronor and Swiss francs. Should you require assistance, you can always get in touch with the Drueck Glueck customer service. The Live Chat option is available within the business hours (8 AM until midnight GMT), but you can also go for a number of other options such as phone (+1 64 77 24 46 91) or email ([email protected]) which are open 24/7 Monday to Sunday.